SINGAPORE - Total wage growth in the private sector remained stable last year (2015), amid softer economic conditions and fewer profitable firms coupled with higher employer contribution rates to the Central Provident Fund (CPF). 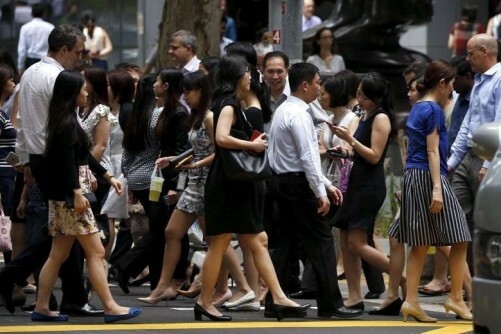 Including bonuses and employer CPF contributions, total wages rose by 4.9 per cent last year, similar to the year before, according to a Manpower Ministry (MOM) report released on Thursday (June 2). After accounting for negative inflation, real total wages grew by 5.4 per cent last year, compared with 3.9 per cent in 2014. Fewer firms turned in a profit last year. Of the 5,100 surveyed, 79 per cent reported that they were profitable, down from 82 per cent of those surveyed in 2014. "As most firms had put in place some form of flexible and performance-based wage system that gave flexibility to adjust wages according to the prevailing business climate, the proportion of employers that gave wage increases to their employees fell in 2015," said the MOM. Fewer than two thirds of private sector employers raised wages last year, compared with 72 per cent in 2014, while nine in 10 employees were under some form of flexible wage system, the highest proportion since 2004.